Windows 10 build 15055 for PC and mobile build 10.0.15055.0 is now available for Fast Ring Insiders. Creators Update insider build is already feature locked, so there are mostly bug fixes and improvements in this build. However, there are some known issues with build also. Recently, Microsoft also released Windows 10 Mobile build 15051 for Fast Ring members with the long list of fixes. Check out the official changelog of the new PC build below. Fixed an issue where sometimes the context menu when right-clicking a misspelled word in Microsoft Edge would launch in an unexpected place or under the Edge window. Fixed an issue from recent builds where Microsoft Edge might immediately show a “Not responding” state after opening a link or pasting a URL in a new tab. Fixed an issue where sometimes the tab mouse-over description tooltips in Microsoft Edge would stay on the screen even after closing the relevant tab. Fixed an issue that could result in Microsoft Edge unexpectedly attempting to download certain webpages rather than navigating to them when the uBlock Origin extension was enabled. Fixed an issue where it wasn’t possible to use touch to set focus to text boxes in Microsoft Edge’s Web Notes in order to enter text. Fixed an issue where, after using Ctrl + W to close multiple tabs in Microsoft Edge at once, the active tab might lose focus and keyboard shortcuts would stop working until moving focus away from and back to the tab. Fixed an issue recently where if you have selected text in Microsoft Edge, moved focus away from the window, then returned focus using Alt + Tab or the mouse, trying to copy the selected text wouldn’t work. We also fixed a recent issue where if you used Ctrl + C to copy selected text in the Edge URL bar, and then Ctrl + Shift + P to open a new InPrivate window or Ctrl + N to open a new regular window, using Ctrl + V to paste the copied URL into the new window’s address bar wouldn’t work. Fixed an issue for Insiders where, if focus was set to a Microsoft Edge window, touchpad and keyboard input might periodically stop working for a few seconds at a time. Windows 10 build 15055 fixed an issue for Insiders with multiple monitors resulting in flickering and rendering issues when the Hub button in Microsoft Edge was pressed. Windows 10 build 15055 fixed an issue where Insiders with multiple monitors might find one of their monitors would stop rendering (with the exception of the mouse). Fixed an issue resulting in Microsoft Groove sometimes no longer rendering correctly after snapping the app to one side of the monitor and changing the size. Fixed an issue from recent flights resulting in the taskbar getting into a state where many of the thumbnail previews would be unexpectedly blank. Fixed an issue for certain USB-powered monitors where the taskbar clock would sometimes stop rendering for a few minutes (seemingly stuck, but would refresh on mouse-over). Fixed an issue where the battery flyout would crash the second time the battery icon in the taskbar was clicked. Windows 10 build 15055 fixed an issue from recent flights resulting in OneDrive.exe unexpectedly sometimes running with a high percent CPU for a long time. Windows 10 build 15055 fixed an issue that Insiders may have experienced resulting in paste not working if the copied content was from a UWP app that was currently suspended. Fixed an issue where certain devices were unexpectedly not being discovered when searching for available pairings to add in Bluetooth & Other Devices Settings. Fixed an issue where for those with certain printers, clicking on “More settings” in the UWP app print dialog would result in the print dialog hanging. Fixed a recent issue where many of the advanced settings dialogs, such as the one seen when searching for driver updates, were grey or had grey components instead of the expected white. Fixed an issue resulting in Windows Defender Antivirus notifications not opening Windows Defender Security Center when clicked. Fixed an issue resulting in a Microsoft Visual C++ Runtime Library error dialog citing a TabTip.exe runtime error unexpectedly appearing on the login screen for some Insiders. There is a bug in Windows 10 build 15055 where if you need to restart your PC due to a pending update like with the latest Surface firmware updates, the restart reminder dialog doesn’t pop up. You should check Settings > Update & security > Windows Update to see if a restart is required. In the last build, we noted that we had fixed the issue where some UWP apps may unexpectedly appear with their app package name in the title bar as opposed to the app name. However, Insiders reported back that they were still seeing apps showing their app package name in the title bar. Fixed an issue from recent flights where the volume control might stop working when listening to music in Groove after an endpoint change (for example plugging in headphones). Improved speech reliability by fixing a bug where Cortana was unexpectedly failing with a connection error. Fixed an issue where multi-turn Cortana speech interactions weren’t working (for example, when creating a reminder in multiple parts, as opposed to doing it in a single sentence). If you are facing issues with build 15055 like error 0xC1900401, build not yet available, download stuck at 0%, high CPU usage issue or other problems with the latest build, check out workaround here. 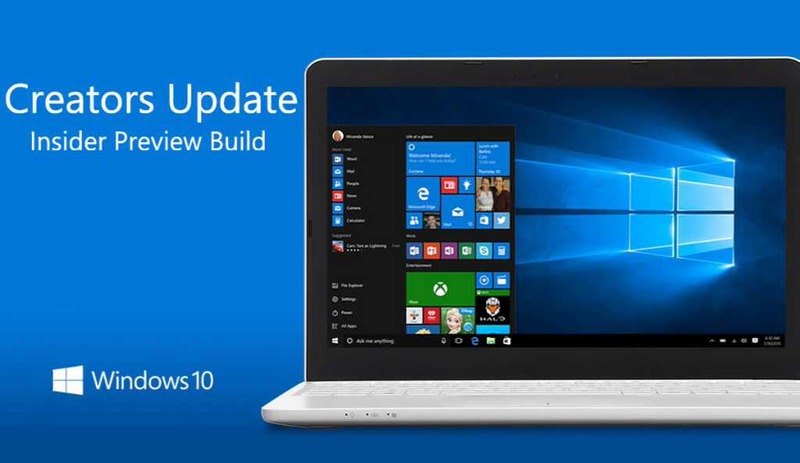 Meanwhile, Windows 10 build 15042 ISO images are now available for download. You can download ISO from here. Official Windows 10 build 15055 ISO files are not available right now. Microsoft is expected to release them later.